I've received a few queries asking whether ombre or gradient manicure could be done with a compact sponge. I used a compact sponge for this manicure. My issue has been getting it to blend out - with the compact sponge you get clear linear demarcation and not much by way of texture. But I find I like this. It actually looks like five different stripes painted on and the colours haven't blended out into each other. 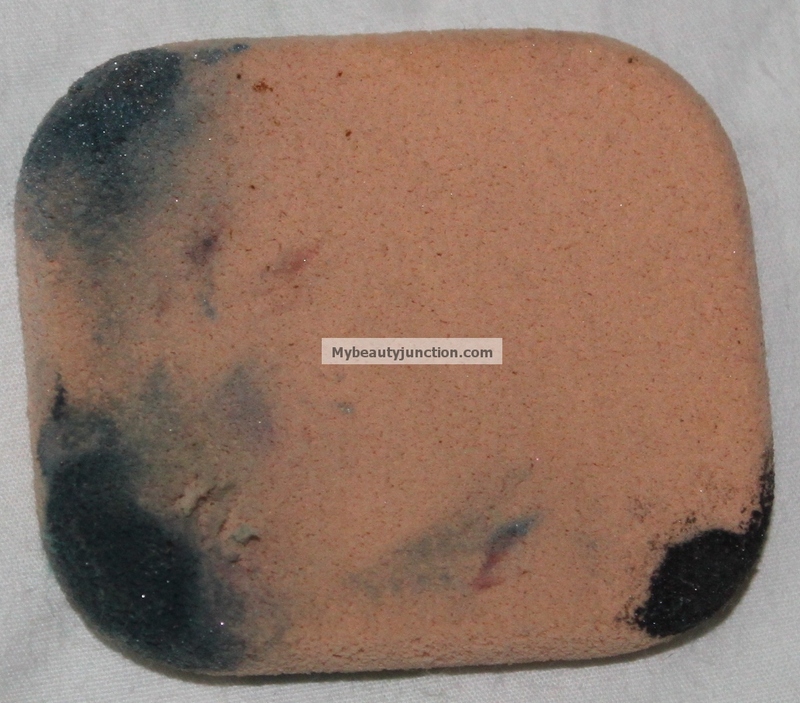 The compact sponge did not soak up much product, unlike the Konad sponge, so it applied as wet as with a brush. And you can reuse the compact sponge (for ombre, not on your face!) whereas the Konad one hardens after a couple of polishes are dabbed up. You can also dab the polish over a dried-up patch on the songe where you already applied polish; it won't be mixed. So the answer is: Yes, you can. But with slightly different results. Most people will be able to blend it out better than I, because I'm an all-thumbs-and-two-left-feet person. I used the regular sponge you get inside compacts. This is from the Shiseido Sheer Mattifying compact. I put the polish on the Konad mixing palette and dabbed the sponge, but for Aruba Blue (the darkest shade) I directly applied the polish on the sponge. For this mani, I used five shades (from nail bed to tip): Essie Aruba Blue, LA Colors Blue Velvet,China Glaze Rainstorm, China Glaze Aqua Baby and Essie Barbados Blue. I then used LA Colors Jewel Tone as a top coat. Next stop: Ombre with a kitchen/cleaning sponge!